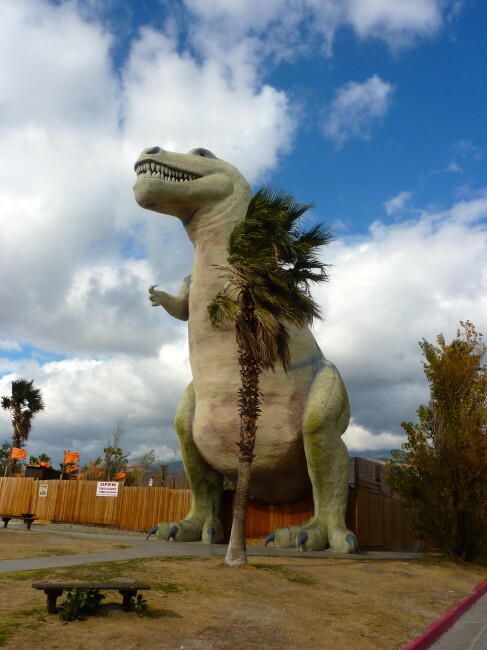 If you have ever driven from Los Angeles to the Palm Springs/Indio area in the lower desert, you might have noticed some prehistoric characters (and they’re not the Rolling Stones) lurking just to the north of Interstate 10 in Cabazon. These are the brainchild of a Knotts Berry Farm sculptor and portrait artist, Claude Bell. He built these to attract customers to his Wheel Inn Cafe, which opened in 1958. 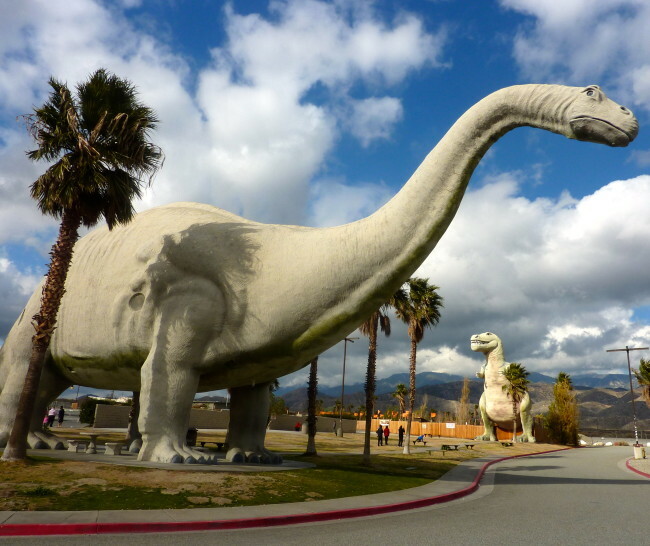 Dinny, the first of the Cabazon dinosaurs, was started in 1964 and created over 11 years. He created Dinny out of extra material salvaged from the construction of nearby Interstate 10 for $300,000. There is a small museum in Dinny’s belly that still sells souvenirs. 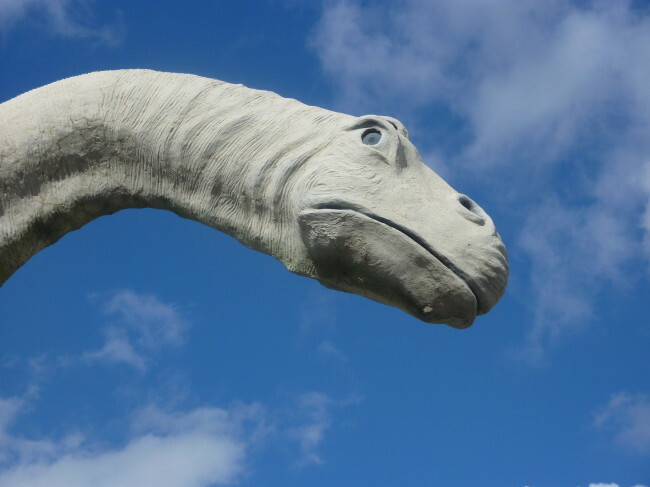 The second dinosaur named Mr. Rex was constructed near Dinny in 1981. Mr. Rex was supposed to have a slide, but Bell died before it was completed. 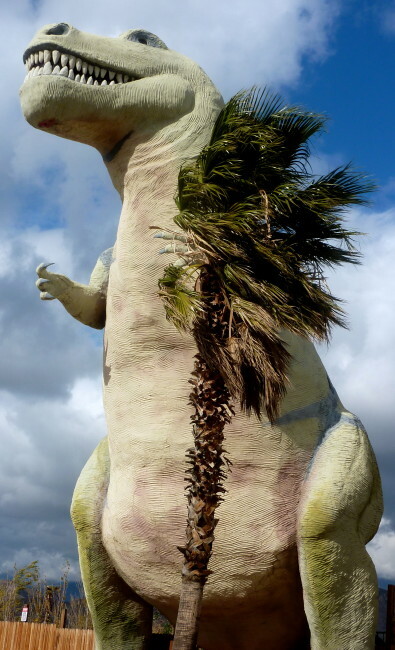 Other dinosaurs were on the drawing board but never came to fruition. 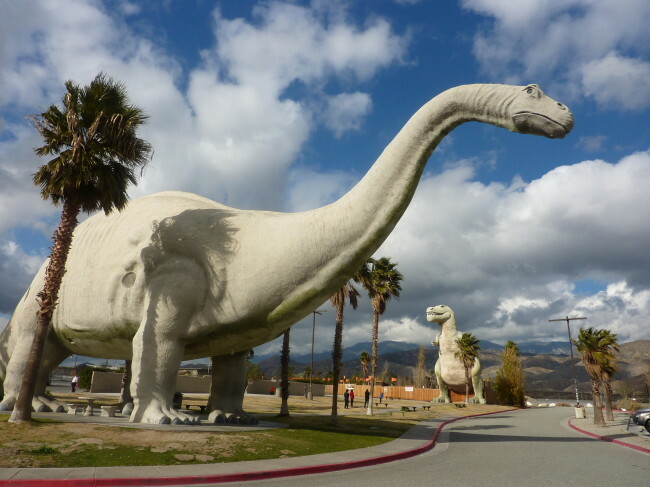 These dinosaurs have been featured in television commercials and the movie, Pee Wee’s Big Adventure. There is an admission charge to go inside the T-Rex and wander around the grounds that have a few smaller dinosaurs “wandering” the property, but I felt a drive-through was more than sufficient. Maybe next time I go by, I’ll splurge.